It could be that there is just 1 web site beneath the site you are about to remove but there could also be 1000 sub sites. I have created the below PowerShell script to automatically start removing site, web and subwebs from SharePoint Online with PowerShell. 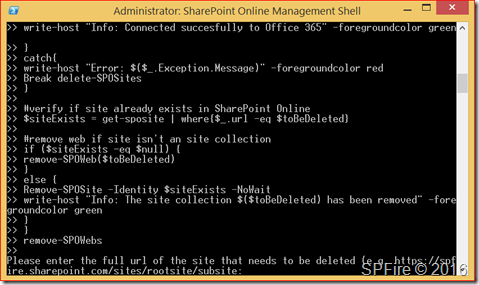 You will need to change the first variables in the remove-SPOWebs function to match your Office 365 tenant and copy this bit to PowerShell. $toBeDeleted = Read-Host "Please enter the full url of the site that needs to be deleted (e.g. https://spfire.sharepoint.com/sites/rootsite/subsite"
first enter the URL that will be the starting point. It will first remove the sub sites and then makes its way to the start site.